The Avocent HMX Manager, HMXMGR-G2-001, provides centralized management and control of HMX extender transmitters and receivers, allowing them to serve as endpoints of a high performance LAN-based KVM switch. This HMX solution provides media professionals with uncompromised switched KVM access to business critical broadcast and post-production video editing systems. 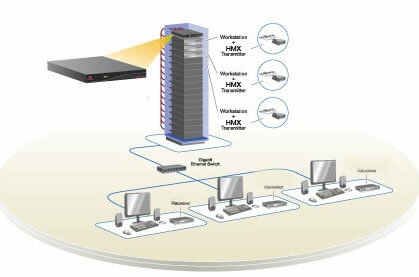 Based on Gigabit Ethernet and highly optimized extension technology, the Avocent HMX extender and the HMX Manager products provide the image quality and responsiveness associated with distance-limited analog KVM switches and the unlimited distance benefits previously only available through less responsive KVM over IP switches. Please Note: The HMXMGR-001 has been replaced with the HMXMGR-G2. This second generation HMX Manager (HMXMGR) ships with HMX Manager version 5.0.0 firmware that can be upgraded to version 6.0.0. Centralization of Computer Assets - HMX Manager ensures business-critical workstations can be placed in a secure location for protection (security and/or environmental), monitoring and maintenance. Security - Centralized login credentials allow administrators to enforce access restrictions to critical systems. Granular settings allow administrators to permit workstation access only from select user stations. This ensures that secure data cannot be viewed from non-secure areas. Web Based Management Administrators can conveniently perform system administration, maintenance and setup from their desk.